I’ve never read or seen Oscar Wilde’s play, The Importance of Being Ernest, but saw the 2002 film with Colin Firth, Reese Witherspoon and Judi Dench. If Wikipedia is any indication, the movie followed the storyline of the play quite well. It’s a silly story about deception. We know “earnest” means sincere. And the irony of the story is that while two gentlemen are claiming to be the (same) man called Ernest, they’re outright lying about it. A brilliant play on words. It all turns out well in the end. Each man gets his girl and their true names comes into the light. 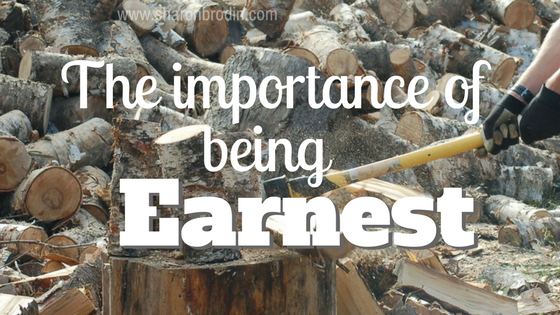 But…as entrepreneurs working from home, it IS important that we be Ernest…or earnest. It’s a real business, we’re doing real work, and we need to treat it like that. And if we’re just starting out, we also need to convince others that we’re doing real work for a real business. I can understand why some work-at-homers get up, shower, dress “for the office” and set a strict schedule for themselves. So they and others take their business seriously. It’s especially important when things aren’t moving along as quickly as we expected. Or when the last thing we want to do is research another list of prospects we need to market to. Or when it’s a beautiful day outside and we’d rather be out there enjoying it (maybe that’s not a problem for you…it can be for me!). Earnest in our work with our clients and customers. Becoming a professional that others know, like and trust is a process. Trust doesn’t come built in. We’ve got to earn it by continually be trustworthy…being earnest. When I say I can finish the project by the end of next week, I finish the project by the end of next week. When I make a mistake, I don’t try to cover it up or make excuses. I ‘fess up, apologize and make it right, if possible. It can be as serious as treating my clients’ business as importantly as I treat my own. Earnest is a choice we make every day. We’re earnest in the business we’re building — working hard to keep educated, market ourselves, follow through with prospects, treat each project as important, stay on top of client nurturing. The habit of being earnest will help carry us through those times when we’re discouraged, overwhelmed or even bored with our daily to-do’s. It’ll help us “put one foot in front of the other” until we get over a slump and regain our enthusiasm and motivation. What have you learned about the importance of being earnest? How has that translated into your daily work life?